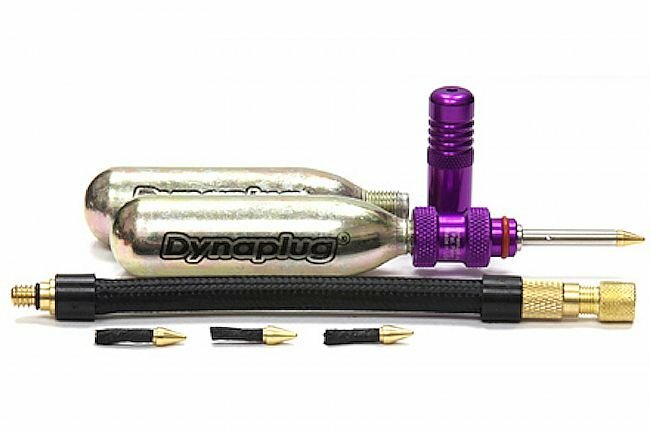 Dynaplug's Air Tubeless Tire Repair Kit includes two threaded 16-gram CO2 cartridges and an air hose. One cartridge fills a 26x4.6 fat tire from 0-14psi and will inflate the average tubeless mountain bike tire to over 50psi. This tool works with all threaded 12-25-gram CO2 cartridges. NOTE: ROAD TIRE Insertion/CO2 Tube and Plugs are about half the length of the MTB style. ROAD TIRE plugs can't be used for MTB insertion & vice versa. Here's how it works: 1) Insert the repair nozzle into the puncture. 2) Open the regulated air valve to achieve the desired pressure. 3) Close the valve and remove the tool. The plug will hold air and seal the puncture simultaneously.